Perm summarizes the results of Women in Art educational project that was held within Diaghilev Festival supported by Metafrax PJSC and its beneficiary owner Seyfeddin Roustamov. One of the participants got the chance to come to the big stage with her creative project the next year. Special Women in Art project held within the educational program of International Diaghilev Festival is over. It was organized with the assistance of the beneficiary owner of Metafrax chemical company, Seyfeddin Roustamov. The project was aimed at supporting girls who chose artistic occupations considered as non-traditional for women. Women in Art covered such arts as opera and symphony conducting, playing percussion instruments and clarinet, and production. During the Festival, participants selected for that project category were working hand in hand with the reputed artists, laureates of international competitions, including Teodor Currentzis, artistic director of Perm Opera and Ballet Theater. Attendees of the educational program had the opportunity to learn from the eminent masters and develop their own projects. One of the presented designs attracted special attention of Metafrax. Fine Chemistry Project of Elena Frolova from Moscow who studies to be a producer got a real chance for implementation. We focus on the chemical industry, so we wanted to see how musical projects and experimental operas associated with all sorts of chemistry, such as human relationships, love, and philosophy, are born. We examined every project, and were struck by the project of Elena Frolova. Now she can implement her creation next year and present it to the public. With Women in Art, I had a unique opportunity to be in an amazing atmosphere where every moment strengthened your sense of purpose. I met many like-minded persons with whom we elaborated our common creative concepts. My project, Fine Chemistry presented under the production category, is devoted to the chemistry as a philosophy, a reflection on the essence of being, feelings, cognition of matter, and self-knowledge. 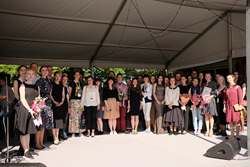 Women in Art ended with an open-air concert where the participants along with other students engaged in the educational program of Diaghilev Festival showed to Perm audience their skills and shared their inspiration for art. The program organizers hope that the ideas presented by the festival participants will not be forgotten and will be embodied in future projects of Diaghilev Festival.